The HUMMER H3 is a mid-size four door five passenger sport utility vehicle. The 2008 Hummer H3 is a different take on the traditional Hummer SUV. The H3 looks almost identical to the H2 both inside and out except that it is a mid-size SUV rather than full-size. While the H2 is built on the same platform as the Chevrolet Tahoe, the H3 starts on the frame of the smaller Chevrolet Colorado. The H3 is a popular choice for those who want the look and feel of the larger Hummer without paying the extra large price. The 2008 Hummer H3 is available in three trim packages. The base package includes 16-inch alloy wheels, air-conditioning, cruise control, full skid plates, OnStar telematics, keyless entry and six-speaker CD stereo with satellite radio. The H3X package adds leather seats, brush guard, steps, power and heated front seats, chrome trim, Monsoon audio system, CD changer and 18-inch chrome wheels. The most expensive and most powerful, trim package is the Alpha package. With the Alpha you get a V8 engine, the same options as the H3X but with 16-inch chrome wheels and no steps or brush guard. There are separate options that can be added to the base model H3. The Adventure package is for the off-road enthusiast and includes off-road suspension, locking rear differential, 33-inch off-road tires, shorter-geared transfer case for hill climbing and a Monsoon audio system with CD changer. The Luxury package comes with the Monsoon audio system, leather seats, powered and heated seats and oversized floor mats. A rearview camera and navigation system can be added to any trim package of the Hummer H3. With only 29.5 cubic feet in the cargo area the Hummer H3 is below average for mid-size SUVs in terms of cargo capacity. Fold the seats down and get 55.7 cubic feet, which is still less than competitors. The Hummer H3 is equipped with a 3.7-liter, five-cylinder, 242 horsepower, 242 ft. lb. of torque engine. With this engine there is a choice of a four-speed automatic or five-speed manual transmission. The Alpha H3 comes with a 5.3-liter, eight-cylinder, 300 horsepower, 320 lb.-ft of torque engine. This engine is only available with the four-speed automatic transmission. The 3.7-liter engine is rated at 14/18 mpg while the 5.3 version gets 13/16 mpg. In a mix of city/highway driving the five-cylinder averaged 17.1 mpg while the eight-cylinder averaged 13.1. 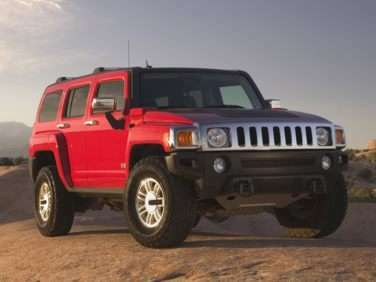 The 2008 Hummer H3 is a safe SUV according to the National Highway Traffic Safety Administration. The NHTSA awarded the 2008 H3 five stars in both frontal driver protection and side impact passenger protection and four stars for frontal passenger protection and side impact driver protection. Standard equipment on the Hummer H3 helps to make every trip safe. Antilock disc brakes, stability control, traction control, full-length side curtain airbags and an OnStar communications are all standard safety features. Optional safety features are offered, including a back-up camera screen which hides within the rearview mirror. The display screen slides out when needed. The 2009 Hummer H3 is a carryover from 2008, with the addition of the new pickup-style H3T. The 2008 H3 is available as either the H3 SUV or the H3T, which grafts a cargo bed onto the rear of the standard SUV. Both editions of the vehicle can be ordered in base, Adventure, Luxury and Alpha trims. The first three are powered by the same 239 horsepower, 5-cylinder engine that also produces 241 lb-ft of torque. A 5-speed automatic transmission is standard on the base and Adventure trims, while the Luxury makes exclusive use of their optional 4-speed automatic. Fuel economy is rated at 14 miles per gallon in the city and 18 miles per gallon on the highway. The H3 SUV also features an additional H3x trim that shares the same mechanicals. The Alpha trim ups the ante with a 5.3 liter V8 engine capable of generating 300 horsepower and 320 lb-ft of torque. A 4-speed automatic is the only transmission available, and fuel mileage drops to 13 miles per gallon around town and 16 miles per gallon in highway cruising. Four-wheel drive is standard for all 2009 H3’s and H3T’s.